Fall is probably my most favorite season of the year and that is partly due to the fact the the cool air seems to contrast so wonderfully with the amazing kitchen aromas that permeate through the air.We cleaned out our community garden plot for another year so I cooked some swiss chard and wonderful beans with our harvest... and although this season makes for more work ( I still have carrots, beets and apples to do) it is so worth it knowing that the wholesome foods that we will ingest only required sunshine, rain, dirt and a little tender loving care. This is cooked in a slow cooker and to quote my husband"what can anyone make that tastes any better than that!! Delicious!!!" Cook until the beans are soft and the meat falls off the bone. 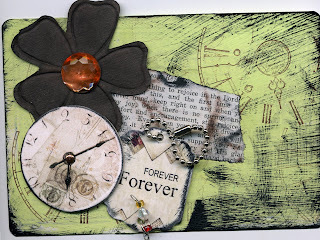 Learn some great ideas on how to scrapbook using recycled items. I have just started folk art painting and this is my first creation called Mavis. It's a mixed media piece on birch wood. 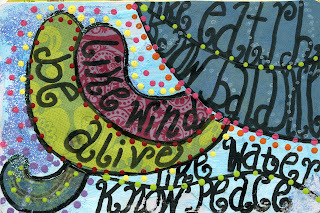 I burned the image and then used printed paper, paint, stamps and pastels to complete. 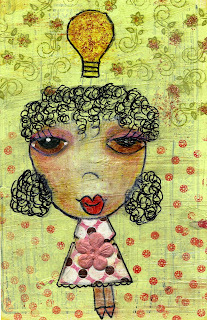 I am taking Les Petites Dolls online workshop with Suzi Blu and the classes are fantastic! Can you believe it! This is the LAST one. What an amazing, creative journey around the sun we've all had and thank you all for joining me! 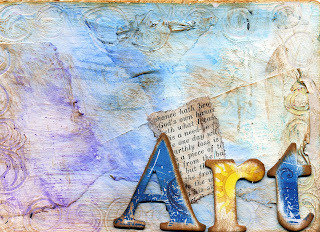 Art is you...It is me...and expressing it is as necessary as the air we breathe. Believe it!...I finally do. Express yourself, always in all ways. A big huge thank you to Emily Falconbridge for your amazing inspiration. This week's prompt is it reminds me of you. Whenever I see the color orange it reminds me of my mother. I can't believe that she is going to be 80 years young in a month! She is truly a wonderful woman and a true legend and has taught us all how to enjoy life to the fullest. 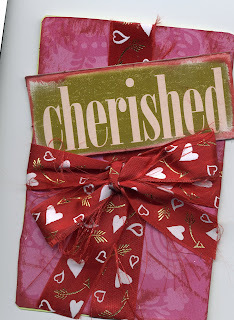 The prompt this week is the best gift you have ever received or given. The best gift that I've ever received and given is unconditional love. The prompt is time flies. Time truly does fly and sometimes it can be a thief taking our loved ones away while at other times, it brings us undescribable joy! Right now though, all is good! For this week the prompt is ideas good ones, bad ones where do you get yours from? etc. My ideas come from everywhere!! 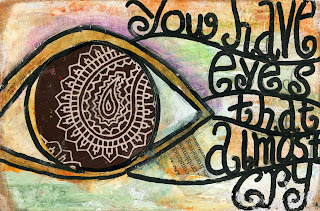 Online, magazines, fellow artists, just from life itself. They just keep coming and it's great!! This week's prompt is my happy place.This year I found my happy place to be most definitely the water. I was so fortunate to have been given the opportunity to dip my toes in three different oceans in less than six months!!! The Atlantic, Carribean and the Pacific. 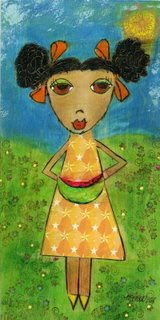 This week's prompt is self realization. I heard somewhere that a person only cries when they feel safe enough to do so. For so long I've never been comfortable showing my feelings, but lately I've found my tears again and that's wonderful!